When people think of night vision, they almost certainly imagine a circle-cropped image with a green tint. While this image is fitting for tactical shots in a Hollywood action flick, the reality is that not all forms of night vision are green. Admittedly, what constitutes ‘true’ night vision has been a point of contention among industry experts for years but we think it’s best to lay out the facts and let you (the consumer) decide. According to Wikipedia, night vision is defined as the ability to see in low-light conditions. This vague collection of words makes no implication as to how the visibility is enhanced nor to the degree which the enhancement takes place. A night vision manufacturer could technically meet this definition by importing an image into photoshop, increasing the brightness, and applying a green tint to help bring out the detail. Lame, right? As it turns out, this is fundamentally how most night vision devices work. As a consumer, it can be difficult to understand how the technologies vary which is why in this article we will be reviewing the three different forms of night vision: tube, infrared, and thermal. However, there is an issue with this approach. What happens when there is no available light to amplify? Will these Gen 1/2/3/4 night vision devices still work? In theory, no. In practice, yes. As it turns out, it’s very difficult to find yourself in a truly lightless environment. Light provided by the moon, stars, and even clouds (which can reflect light from nearby sources) are all more than enough for these image intensifier tubes. 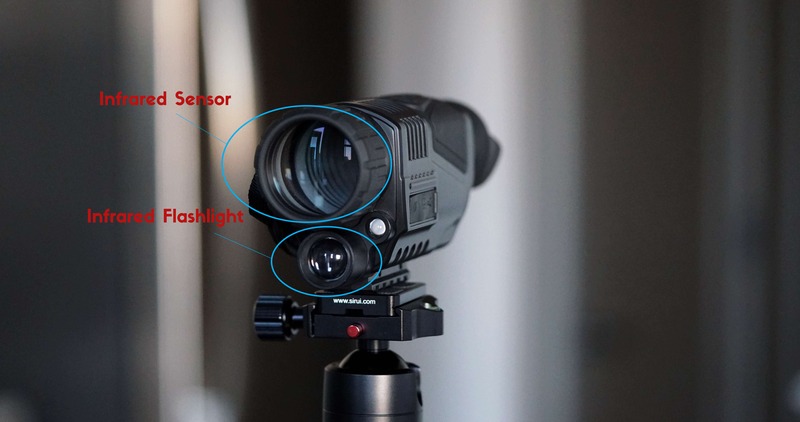 Even if you did find yourself in a truly dark environment, most of these image intensifier tube-based devices are actually equipped with another night vision technology known as infrared illumination. Generally speaking, infrared illumination is avoided in tactical/military applications because it can reveal your position to a potential combatant but there are certain scenarios in which it can be useful. For this reason, these devices are usually equipped with infrared illuminators but are not actually used that often. Another issue with tube devices is accessibility. Not only are they incredibly expensive but they are heavily regulated throughout the world. Due to the sensitive nature of the technology, the import and export of these types of products is usually restricted. This is why you will never see an American night vision manufacturer that ships outside the United States. It’s illegal! The same law applies to many allied countries as well. Infrared night vision, also known as digital night vision, is a relatively new invention and has garnered much controversy in the community. Infrared optics are not optimized to amplify ambient light and instead depend on active illumination. These illuminators are often mounted directly to the device and work by emitting an invisible wavelength of light which is then reflected and captured by an inboard sensor. This sensor constructs an image of the environment and plays it back to the viewer through an internal display screen. Infrared night vision is considered by many to be the best value for the average enthusiast. It’s cheap, effective, and far more reliable than tube devices. It even has some advantages over the other methods. For example, tube devices are prone to burning out whereas infrared sensors are not. Thermal imaging is a unique form of night vision which works by detecting differences in radiant heat energy. Similar to the amplification method discussed above, thermal imagers are also a passive form of night vision and don’t need any active sources of energy to operate. These devices use an extremely sensitive instrument called a bolometer which detect differences as small as 0.01 celsius. Using the contrasting heat signatures, the thermal device is then able to construct an image of the environment with remarkable detail. Thermal imagers have a myriad of advantages over other night vision methods. For example, light sensitive optics often can not effectively be used during the daytime or even during periods of moderate light (such as sunset) whereas thermal imagers can. Shining a spotlight at an infrared optic or a tube optic is guaranteed to render it almost entirely worthless (and will probably destroy the tube optic). Thermal imagers on the other hand would not be phased at all. As you can see, night vision is achievable in many different ways and each method has its pros and cons. Having an understanding of how the technology works can help with making the right decision when it comes time to shop. Critics and enthusiasts from all sides will have strong opinions on the matter but many of them forget to ask the most important question of all: does it work for me? With that being said, I will leave you with some fun factoids you may not know about night vision. Fun Fact #1: There are applications available which can actually turn your phone into a night vision device. These applications work at the hardware level to reduce camera shutter speed which in turn captures more light per frame. Combine this with some basic image manipulation and the end result is far more impressive than you would think. Fun Fact #2: Most infrared optics are nothing more than glorified camcorders! Think about it. How is it that they all have the same picture, video, and playback functions? The only difference is usually the addition of an infrared illuminator and a slightly modified sensor. In some cases, changing the sensor isn’t even needed! Most camera sensors can easily detect infrared.